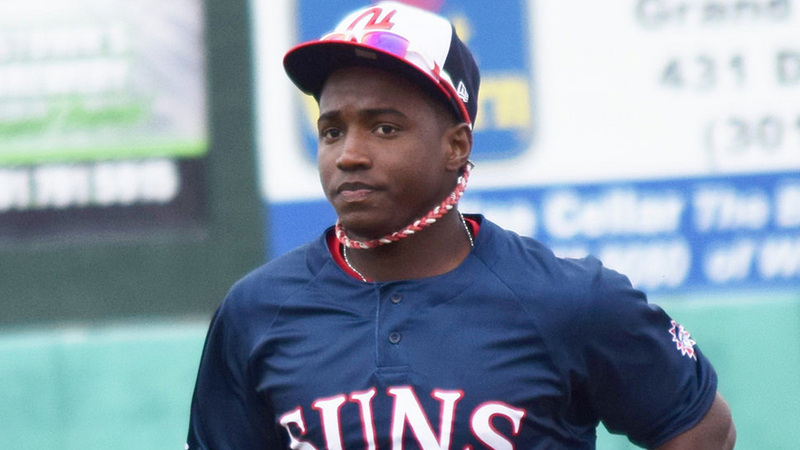 Victor Robles might be the toolsiest prospect in the Minor Leagues. Still only 19, the Nationals center fielder ranges from average to near-elite in all five of the major tools. But there's one tool that makes the game's No. 10 overall prospect clearly stand out from his peers on MLB.com's list of top-100 prospects -- speed. On the surface, speed is one of the easiest attributes to quantify. The 100-meter dash is a popular gauge since it's so simplistic -- line up, run in a straight line, first past the line is the fastest. In baseball, we don't have to guess how fast players are. Scouts have stopwatches to measure home-to-first times to get a concrete evaluation. Stolen-base percentage: How good is the player at stealing a base once he decides to go? Frequency of attempts: It's one thing to be perfect in stolen bases, but if perfect means 1-for-1, that doesn't tell us much. Speedy players are more likely to attempt to steal each time they get on base. Runs-scored percentage: By the same token, speedy players are more likely to wheel around the bases and score than slower runners, who could be thrown out or stopped prematurely at third. In sum, to have a good Speed Score, a player should attempt to steal a lot of bases, be successful at stealing bases, race for triples and score a ton of runs. Which brings us to Robles, who did a good job ticking all those boxes between Class A Hagerstown, Class A Advanced Potomac and a five-game rehab stint in the Rookie-level Gulf Coast League. The stat typically tied to speed is, of course, the stolen base, and Robles thrived there again in 2016. The six-foot outfielder swiped 37 bags, third among top-100 prospects behind only Moncada (45) and Bradley Zimmer (38). But what Spd truly liked about Robles was how often he tried to go for the extra base -- 51 attempts over 110 games in a season that was limited by a broken hand he suffered in late July. His 9.5 in frequency of attempts led all top-100 prospects because of his willingness to go, and that came in part from an organizational philosophy with the Nationals. "We give them that green light usually because we want to give them some freedom," said Potomac manager Tripp Keister. "Not only do you learn by going and getting that stolen base, but at this level, you can learn from the times you can't go. We want them to learn when not to go.... If I'm controlling him, he's not necessarily learning. We talk about what is a good time to go, like curveball counts and other things like that, but he has to take that green light and learn from it." Part of that education involved the occasional delayed steal. The Nats always wanted the tactic to be an option for their speedsters in the Minors, and with Robles' motor grading out at 70 on the 20-80 scouting scale, according to MLB.com, Keister said the Dominican Republic native was the perfect candidate to catch opposing batteries and their infield cohorts off-guard. But the most excitement came when Robles' speed just overcame the competition. "To me, being a basestealer is stealing when everyone knows you're going," Keister said. "You think back to Dave Roberts for the Red Sox [in Game 4 of the 2004 ALCS]. Everyone knows he's going, but he still gets the bag. Victor's learning to be that guy." But it's not just steals that gave Robles a boost in Spd. The game's No. 10 overall prospect raced for eight triples over 118 hits in 421 at-bats, making him one of 11 top-100 prospects to receive a 10 on the percentage-of-triples component. He was almost as strong in terms of runs scored, coming around to score 75 times on the 150 times he reached base via a hit or a walk, resulting in a 9.2 for runs-scored percentage. It didn't take long for Keister to see that baserunning prowess up-close after Robles was promoted from Class A Hagerstown on June 27, having hit .305/.405/.459 with 19 steals over 64 games in the South Atlantic League. "When guys get called up, we talk weekly among managers in the system about what to expect," Keister said. "So when the Hagerstown manager [Patrick Anderson] called me up, one of the biggest things he said was, 'If he's on first and the ball's hit to the gap, don't just assume he's only going to third because he'll definitely go first to third on a long single.' Now, I'm thinking that definitely changes my reaction time as third-base coach and gets me thinking about where I have to be when that happens." While Robles' speed might be his most present tool after his first full season in the Minors, there remain other areas of growth if he is to hit his high ceiling. The right-hander's power is his only potentially below-average tool, grading out at 45 after he hit nine homers over 110 games in 2016, and Keister noted he'd like to see Robles improve on his plate discipline after he batted just .262/.354/.387 during his 41-game stint in Potomac. But with some impressive overall hitting ability, a good arm in center, and of course, plus-plus speed on both defense and the basepaths, he'll be one of the easiest prospects to dream about when we make the turn toward the 2017 season. On speed alone, he's already evoking one of the game's best speedsters, who swiped 33 bags and already mans Washington's center field, though he could move back to shortstop in the years to come should Robles move as quickly through the system as he does on the diamond. "I never had the chance to manage Trea Turner when he got here," Keister said, "but based on what I've seen from both, he's a lot like that guy." A full breakdown of top-100 prospect Speed Scores can be found here in these extended tables. If you're wondering who led all of the Minors in Speed Score in 2016, that was A's 2016 27th-round pick Cole Gruber with a perfect 10.0. The University of Nebraska Omaha product went 28-for-30 in stolen-base attempts and added two triples and 29 runs scored over 35 games for Oakland's Rookie-level Arizona League affiliate. This wasn't out of the blue for the 22-year-old center fielder after he finished third in the nation with 43 stolen bases in 50 attempts during his final season with UNO. For Isolated Power (ISO), we were able to use the averages of ISO and power grades to see which prospects outperformed their expected power. Doing the same for Speed Score resulted in an average Spd of 5.4 and a standard deviation of 1.79. Using those numbers, the biggest overperformers were two first basemen with 20 speed in Padres prospect Josh Naylor (4.7 Spd) and Indians prospect Bobby Bradley (3.5 Spd). Given their lack of a run tool, we would have expected the pair to post Speed Scores starting with a zero. However, Naylor was able to get out of that basement with 11 steals on 15 attempts between Class A Greensboro and Class A Advanced Lake Elsinore, while Bradley was a perfect 3-for-3 but relied more heavily on his 82 runs scored, which ranked fourth in the Class A Advanced Carolina League. Don't expect either to be called burners anytime soon though. Naylor's stolen bases will decrease significantly against better batteries -- he went just 1-for-2 in steals over 33 games in the California League -- and Bradley was the benefactor of a Lynchburg carousel of an offense that scored 69 more runs than anyone else on the circuit. The top-100 prospect who most underperformed his speed tool in 2016 was No. 3 Reds prospect Jesse Winker. The 23-year-old outfielder, considered below average with 40-grade speed, did not attempt a stolen base and did not hit a triple over 393 at-bats between Triple-A Louisville and the Arizona League, making his 0.8 Speed Score last among top-100 prospects.